What is a modern monastery like? Well, my first month at the Monastic Academy was intense. The residents were friendly, and warm and seemed to be natural in a way I hadn’t experienced from many people. They weren’t afraid to be weird, and they seemed less affected by the standards imposed by society. My own uniqueness has been something I’ve struggled with. It’s caused difficulties in the past so watching the folks be relaxed was a wonderful feeling, but also a little intimidating. Could I learn to be genuine by being around people who are comfortable being themselves? What if I couldn’t? I came to the Monastic Academy to heal myself and that is what began to happen. I arrived a few days before the first retreat, which is a week of silent meditation, silent meals, silent free period, so basically just silence. The transition from less than an hour of daily meditation to 7 hours (some walking, mostly sitting) plus an additional hour of chanting is a little overwhelming. My body hurt, my mind ran wild. I looked forward to the times I could gaze out the window at the beautiful property in the Green Mountains in northern Vermont. For as long as I remembered, my body has been filled with tension, because of this it has been rigid and inflexible. I spent years doing yoga on and off with some improvements, which vanished quickly if I stopped the practice. At the beginning of the retreat, I got feedback on ways to improve my posture. The changes were very painful and hard to maintain as they required a constant focus. It was clear I needed to learn to maintain them inside the zendo (meditation room) and outside. It was painful to sit, eat, and walk, but I persevered. I started to notice two things happen, the first was a large knot of tension in my upper back that dramatically relaxed. The week before in yoga I couldn’t put my arms straight up above my head and even come close to touching them together because of the tension. By the end of the first retreat I could easily touch them together with no noticeable discomfort. The second thing I noticed was that every time I corrected my posture, my mind gave a reason not to. Despite my thoughts I was able to do it anyway. My mind didn’t have to control my actions the way it had my entire life. Being controlled by my mind has caused immense suffering in my life. I’ve struggled with food and masturbation addictions. Like many I’ve been aware of things that can correct these issues, but my mind always found a reason not to. If my mind said it, I did it, even if that was eating four pieces of pizza past the point of feeling full, breaking every diet I ever tried, or avoiding the pursuit of things that truly mattered to me. Both of these moments were exhilarating. During the many walking periods I spent time walking the grounds. The view is breathtaking. The monastery itself sits on a mountain overlooking an ebb and flow of forest covered mountains and valleys. The property has several ponds teeming with dragonflies, frogs and all manner of life. It was quite a contrast from my previous residence in a boxy apartment complex overlooking a Steak and Shake in Columbus Ohio. The transition from silent retreat back into life of talking, internet, and running a non-profit between 8:40am and 6 (sometimes 7:30pm) was a little jarring. In silence, it’s much easier to maintain a meditation technique outside of the zendo, when you talk, when other people talk, and of course life itself is unexpected, so it becomes easy to lose track of the technique. I realized I had been staring at facebook during one of my free periods for almost half an hour without practicing, and that was on day one! Mindfulness is challenging. I found myself struggling to let go of the experience of being so deep inside of myself on retreat. As I talked to the residents, it slowly became normal again. We enjoyed quite a few interesting conversations in the sauna and shared our stories of retreat, our lives and our interests. The connection to others eased the transition. 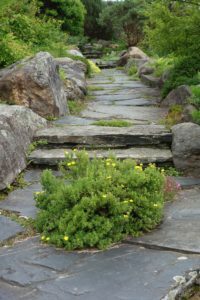 There is a strange balance between a deep need for isolation during the retreats and a deep need for connections outside of them. After a month here, I’ve learned a lot about myself. I’m capable of more than I thought. While doing small tasks I found out I like fixing things with my hands. The intense schedule took so me getting used to but it turns out I do better in an environment of structure. I realized the importance of being around people who can be themselves, and allow me to be myself. Most importantly I found out I really can heal. I’m very thankful for my time so far at the Center for Mindful Learning, and I look forward to seeing where this journey takes me.